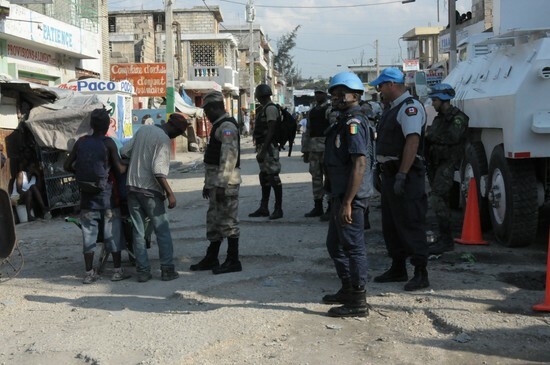 62 people including 6 gang leaders were arrested during a joint operation led by the Haiti National Police (HNP) and MINUSTAH police and troops in Delmas 2 and Bel Air, two popular neighborhoods of Port-au-Prince. Some 126 HNP supported by 28 MINUSTAH police and 326 UN troops took part in the operation held on Friday January 25th in response to an increase of violence in the area. 5 rapid intervention teams conducted searches while 13 checkpoints cordoned-off the area during the operation. Some 6 stolen motorbikes were also recovered. According to HNP, this operation followed a recent spike in shootings, rapes and gang activity in these popular neighborhoods.